Student Affairs focuses on experiences both inside and outside the classroom that will help students as they transition through their years at the university students and into a career. With the department of Career Services, students and alumni are empowered to build bridges to their future careers. Aztec Career Connection enhances connections between employers and students, giving students 24/7 online access to Career Services. 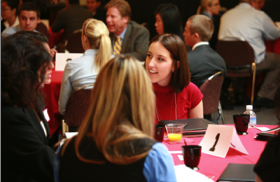 Since 2009, Career Services has sponsored a “Speed Networking Series” for each of the colleges. The program allows juniors and seniors to develop their networking skills by meeting with professionals in a rotational format during a 3-hour event. The 2012-13 academic year was the fourth year that Career Services offered Speed Networking with Professionals. We worked with the College of Sciences and the College of Health & Human Services to create "Discovering Your Dream Career" at Scripps Cottage. It was a sell-out event with standing-room only and involved several employers and over 70 students. Career Services also worked with the College of Engineering to update their Speed Networking event with a local-area young professionals panel in Fall 2012 and a Spring 2013 resume workshop with a recruiter from Twitter. During the 2012-13 academic year, Career Services held a Leadership Panel in coordination with AS, the Veterans Center, College Councils and Student Life and Leadership. During the 2012-13 academic year, Career Services provided 130-plus workshops by Career Counselors and others including STEM-focused staff to a variety of classes, student organizations and community organizations. In 2011, SDSU Career Services, in partnership with the President's Office and the American Association of University Women, offered on campus for the first time the $mart $tart Salary Negotiation Workshop. This workshop gave students, especially women and minorities, the chance to learn how to effectively negotiate salaries and benefits. Pre- and post-event surveys showed that this event provided students with valuable information to approach final phass of the job search with much-needed skills and confidence. Career Fairs provide a forum to meet and talk informally with employers about full-time, part-time, volunteer, and internship opportunities. Each October, SDSU Career Services — in collaboration with the College of Engineering and the College of Sciences — offers the campuswide STEM Careers Month. STEM (Science, Technology, Engineering, Mathematics) events give students a chance to learn about occupations and meet professionals in those fields. Learn more about STEM opportunities through SDSU Career Services!